3dcart Ecommerce Software allows you to set up online payment methods through merchant account services such as PayPal, Amazon Pay or Authorize.Net to process payments online. These payments methods connect to your store through what are known as payment "gateways" and they allow you to accept credit card payments in real time from your 3dcart store. In order to use these gateways, you must first set up an account with the individual merchant account provider. 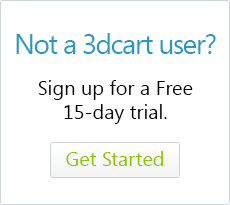 3dcart offers integration with over 100 different pre-integrated ecommerce payment gateways, so you have quite a few options to choose from. The first type of Merchant Processors are known as "Redirect Gateways." These are providers such as PayPal Express/Standard and Checkout by Amazon which direct your customers to their respective account login pages in order to process payment. (Hence the term "redirect") After payment is processed through these gateways, the customer is then once again directed back to your store. The second type of Merchant Processors are known as "Transparent Gateways." These are made possible through providers such as Linkpoint, AuthorizeNet, and others which allow the customer to input their credit card securely to the order and go through the processing steps without ever leaving your store. In other words, these gateways do NOT redirect the customer to an external site whatsoever. In the "Payment Methods" section, click on "Select Payment"
While here, also select the payment method that you'd like to add using the "Payment Method" drop down menu. Once you're ready, click "+Add"
After the Payment Method is created, it will be added to your store's list of Gateways. You can now click on the "Settings" link for the payment method to enter your account specifics with that particular method. (This will be information you receive from the payment gateway service itself.) Some gateways will use a login username or account ID while others use an account ID combined with a PEM file. Check with your specific merchant provider for more details. If using multiple gateways on your store to offer both redirect gateway options (like PayPal Express) and transparent payments (like AuthorizeNet), it helps to label each payment method's caption slightly different from each other. You can do this by clicking on the "Advanced Settings" button for the payment method (after going into its settings) and updating the "Description" section. This way, if there is ever a problem with an order due to the payment method, you can tell more easily which payment was being used at the time by viewing it on the order itself. To see a list of payment gateways we integrate with, please review our listings on our Payment Providers page.